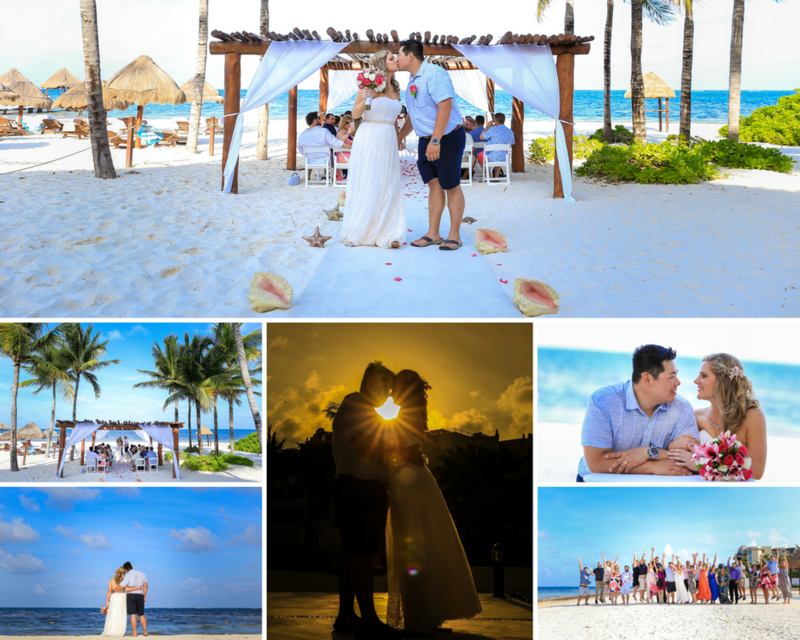 ​"Choosing to have a destination wedding seemed perfect for us as we both always wanted to have a small intimate wedding. We felt like some weddings you attend can be forgettable, but for us and our guests it was whole week of experiences and great memories to keep. Many of my friends and family who attended told me that they had such a wonderful time and will never forget the trip or our wedding for that matter!" The Food! There were so many food options and it was all delicious. I especially liked the coffee bar with all the cakes and pastries. All of the restaurants were very good and had a lot of variety, you were always eating something new. We chose the Excellence Gold package, which I thought was worth the extra. The Caribbean Trio that played during our cocktail hour as John and I had pictures taken was a nice touch for our guests. I also liked having the upgraded options for the food menu, the flowers, and also my hair and make-up. You can tell they are pros at this, the flower arrangements were beautiful and the woman who did my hair and make up did a fabulous job. My favorite part of the wedding was the reception dinner. I had all of my guests at one big table right on the beach. It was awesome to eat dinner and celebrate with my loved ones with the best scenery around. The resort staff that worked at the reception was super attentive and hospitable. They did a great job! Why did you choose to partner with Love to Travel for your destination wedding? I chose Love to Travel because at first I tried to book things on my own and it was just too hard. I had difficulty getting the resorts to get back to me, and finding the correct contact person. I honestly just did a Google search for Travel Agents in my area that do destination weddings and I chose Love to Travel based on their good online reviews. How was your experience with Love to Travel? We had a great experience with Love to Travel. Kim met with us to discuss our options and the resorts and she was very informative. From meeting with Kim to our actual wedding day was less than 6 months so Love to Travel was able to book everything for all of our guests in a relatively short amount of time. I liked how they coordinated all the travel arrangements with our guests which made it easier for John and me because we had an expert to refer our guests to. Some of our guests had never been out of the country and had questions that Love to Travel was able to answer. These resort do weddings every single day and are like well oiled machines! If you are worried or apprehensive about anything, don't be. At first I was worried because I wasn't able to see anything in person, do any taste tests, or hair and make up trials. The people who work these wedding are pros and the resort far exceeded my expectations and it was all wonderful.